Would you like to know a little more about Yvonne Hartman? "You have the most beautiful voice. I could sit and listen to you for hours." Yvonne Hartman is indeed "The Real Deal"....about as fresh and genuine as they come. She truly wears her faith on her sleeve, in clear view, and is a living testimony of what is possible when you put your complete faith and trust in Jesus Christ. As she very clearly sings and coveys via her song "More Like Him", true victory, along with the ability to overcome whatever life throws at us, can only be achieved if, like Christ, we are willing to "Dine with sinners, just like Jesus did, forgive our Brothers, forgive and be forgiven. Love our neighbors....love like Jesus loved, to be more like Him". Kinda sums up Yvonne's whole outlook on life, love, and her entire music ministry. Wonderful uplifting music! Yvonne clearly puts her heart and Jesus Christ into everyone of her songs. I love listening to my kids sing along to her music in the back seat of the car or when they are getting ready for school! Her music is relatable and always reminds me to put my focus back on God. Without a doubt, one of our favorite albums!!! Yvonne started her music ministry in 2006. 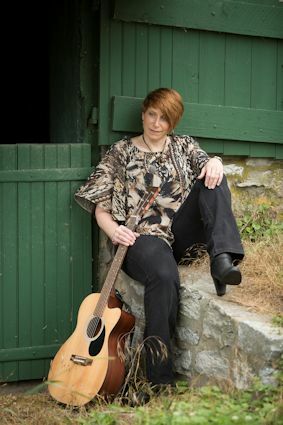 Yvonne Hartman is a contemporary Christian singer/ songwriter based in Pennsylvania whose latest album, “Great Adventure ,” was released in November 2018. Her songs are described as “inspirational / situational,” pulling from experiences and everyday struggles, while providing encouragement for believers. After singing all her life in church choir, school chorus, and musicals, Yvonne started writing her own original music and performing in 2006. After releasing several projects herself, she formed a band with her family called B9 Fate, through which she released one album, “BGTF.” She eventually started playing again under her own name, and released two more projects, “Send Me” and “Remade”. In 2018, she released her latest album, "Great Adventure" and she is currently working on completing that full album. The songs on Yvonne’s new albums showcase her maturity as a singer / songwriter. She has truly found her voice as a Christian artist, and she is writing songs that are capturing new fans across the globe. “Remade” and "Great Adventure" are produced by multi-platinum music producer Kevin McNoldy (http://cphonicmastering.com), who has worked with Dave Matthews, Mary Chapin Carpenter, The Backstreet Boys, and many more. The albums are available on CD, via all online stores including iTunes and Amazon, and on all streaming services such as Spotify, Amazon, Google Play, and Apple Music. Yvonne’s own independent record label / publishing imprint is handling the release of all new music. Yvonne is touring in support of her new music. Yvonne lives on a farm in Oley, PA along with her husband and two children. My CDs are available here on my Music Page, including my latest CD, Great Adventure! Don't use CDs anymore? Songs available for download or on USB drives. I attended the InspireSong Songwriters Retreat in Apsen, CO this past May. What an awesome experience! One of the highlights was when they broke us up into small groups, our mentor was Matthew West! Our group wrote a song called "Cannot Keep It In" that is on my new CD.